DEA spokesman: "We've been looking into it for the past two years"
(CNN) -- The Drug Enforcement Administration said Wednesday it's considering tighter restrictions on propofol, a drug reportedly found after Michael Jackson's death in the Holmby Hills, California, mansion he rented. The Drug Enforcement Administration said Wednesday it's considering tighter restrictions on propofol. "We were petitioned and have been been looking into it for the past two years," said DEA spokesman Rusty Payne, who added in response to a question that the inquiry had not been affected by the singer's death of cardiac arrest on June 25. The agency is looking at designating the sedative as a "scheduled" drug, which would tighten restrictions on the its distribution and use. Payne said he could not divulge anything related to the Jackson investigation, "but I can tell you that researchers making the decision about propofol would typically be interested in any information that would help them answer questions about the effects of propofol and its potential harm to the user." Propofol, known by the trade name of Diprivan, is administered intravenously in operating rooms as a powerful anesthetic and sedative. Payne said concern about the drug's potential for abuse led to the petition. But, he added, "as far as we know, this is not something that's been highly abused." Payne said he did not know who had sought the change, adding, "Typically we would not make that public." The process required to get a drug scheduled is a lengthy one, involving a number of agencies, he said. "Lots of experts weigh in on questions such as potential for abuse, pharmacological effects, history and current patterns abuse," he said. Nutritionist Cherilyn Lee has said Jackson pleaded for the drug as a sleep aid, despite being told of its potentially harmful effects. And sources close to Jackson told CNN that the insomniac singer traveled with an anesthesiologist who would "take him down" at night and "bring him back up" during a world tour in the mid-1990s. The Associated Press and The Los Angeles Times, citing unidentified sources, have reported that police found Diprivan among Jackson's medicines. Officials have said that the exact cause of death and whether drug use may have been involved will not be determined until after toxicology tests are completed, which could be several weeks. On Monday, the Centers for Disease Control and Prevention issued a health advisory, saying two lots of a generic version of the drug had tested positive for endotoxin, a contaminant. The drug maker, Teva Pharmaceuticals, voluntarily recalled the lots. No fatalities were reported. A Teva spokeswoman said the DEA had contacted the drug maker "about a specific lot number, and that lot number is not from the two we are recalling." Spokeswoman Denise Bradley would not say whether the contact was related to the Jackson investigation. A DEA spokesman said he could not comment on any ongoing investigation. 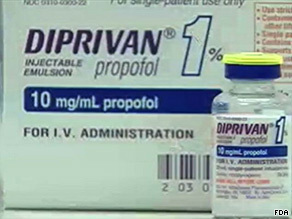 In a written statement issued this month, the American Society of Anesthesiologists said it "unequivocally maintains that Diprivan, or its generic name propofol, is a drug meant only for use in a medical setting by professionals trained in the provision of general anesthesia. "Though the drug is often used for procedures requiring sedation, patients can have extremely variable responses to the drug and some patients can become completely anesthetized, including losing the ability to breathe," the statement continued. "Diprivan should never be used outside of a controlled and monitored medical setting. Use of the drug should be directly supervised by a physician trained in anesthesia and qualified to provide physiologic rescue should too much drug be given," the statement said.